Freshly dried lavender, of course! 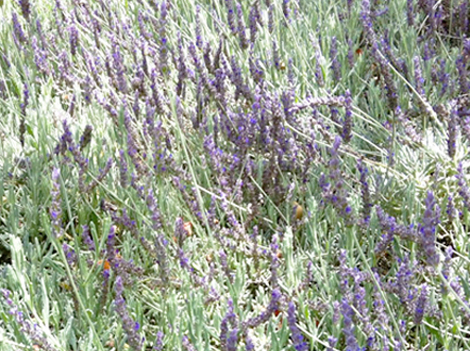 Have you noticed a fragrant, lush lavender bush growing in your neighbor’s front yard? Or perhaps a similar shrub adorns your office entryway, or lines a section of that trail you hike? Well, the next time you take notice of said bush, sneak back later with a pair of shears, and cut a handful of stalks. The trimmed flowers should have the longest stem possible: below the purple buds, just above where the plant’s leaves start. Once you’ve cut a sizable amount of lavender, tie the stems together with a rubber band. String won’t work – the plant shrinks while drying and the rubber band’s elasticity is key. Hang the bushel upside down in a dark place, like a closet or a dungeon, and leave it alone for a while. A month later, when you’re looking everywhere for your jorts and discover the dried lavender you forgot about, gather some goods you have lying around your house to get this project started. Any breathable fabric or material. Go crazy with it. I used cheesecloth, but a burlap potato sack or old T-shirt would do the trick. Old lacey undies for decoration. Needle and thread. Mine’s from a hotel’s mending kit. 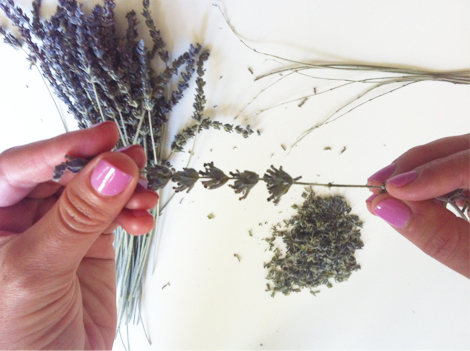 Remove the dried lavender by pulling the flowers down, off the stem. Crush it up a lil’ between your fingers. Next step, cut squares out of your breathable material to make the body of the sachet. You can make them any size you’d like, but mine were about 5″ x 5″. The cheesecloth I used was extremely porous, so I doubled the fabric up for each square to prevent the dried lavender from escaping. 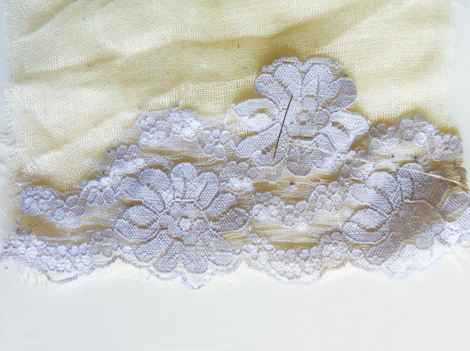 Cut your undies apart, and stitch a selection of the pretty lace pattern onto your fabric squares. Place your two fabric squares on top of one another, and sew three of the sides together to make a little baggy. You can sew them with whatever method you’re comfortable with, but I used a simple whipstitch. (Look it up.) 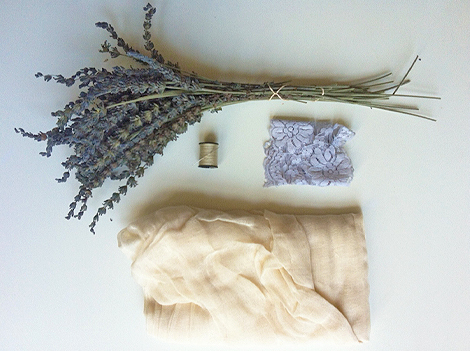 Fill the baggy with your dried lavender flowers, and sew up the fourth side of your sachet. And would you look at that. It looks niiice and smells so good! 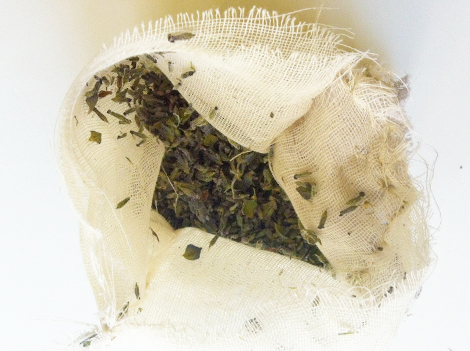 You can do whatever you’d like with this sachet, ie: store it in your lingerie drawer, car, purse, pillow, pocket, etc. 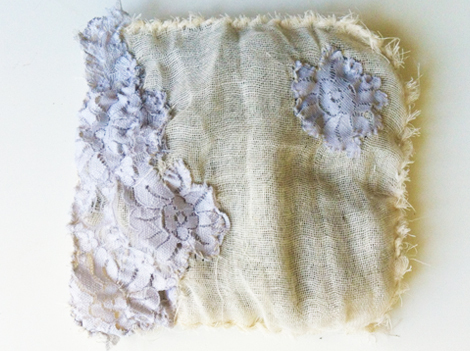 Lavender sachet. Good for your soul, you won’t smell like a troll. Glad to see you don’t have to toss out those old undies. It’s like making a feast out of leftovers. Your old undies never Looked or smelled better! You are one resourceful lass. Is that Jun of Wash U design fame? Hello Jun! I am going to snip me some lavender ASAP!!!! I agree with your premise. I would like your take on whehetr you think my ideas on a blog fit with this.We are starting a blog connected to our Kornerking product. Our plans are to do videos of installing kitchen organization items such as rollouts, waste containers ,breadboards, etc as DIY projects. Helpful tips for the homeowner. Yes we will have these items available for sale on our site. Is offering advice such as this some of what you are referring to.